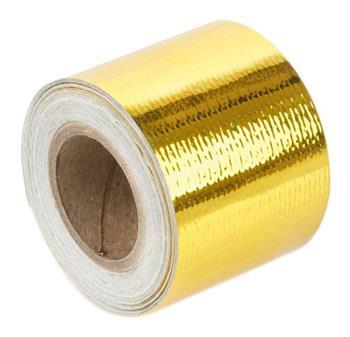 Torque Solution Gold Reflective Heat Tape is highly effective for protecting firewalls, fuel cells, engine covers, under hoods, engine compartment, bulk heads and any other areas that needs protection from heat. Our tape is comprised of high temperature adhesive backing, laminated fiberglass cloth and an aluminum polymer gold skin. Applications: Engine Cover, Under Hood, Firewall, Bulkhead, Fuel Cell, Fuel Lines, Wiring, etc.